The key can be used to lock and unlock the car from a distance . The remote control transmitter and the battery are integrated in the key. The receiver is located in the vehicle interior. The remote control range is several metres around the vehicle when the battery is fully charged. If the vehicle cannot be opened and closed using the vehicle key, the vehicle key will have to be re-synchronised , or the battery in the key replaced . Several vehicle keys can be used. Press button or to release the key bit and fold it out. To fold in, press button ① and simultaneously fold in the key bit until it clicks into place. Only press the alarm button in the event of an emergency. Once the button is pressed, the horn is sounded and the vehicle lights flash. Press the alarm button again to switch off the alarm. You will need to quote the vehicle chassis number when ordering a replacement key or additional remote control keys. Every new key contains a microchip which must be encoded with the data for the vehicle's electronic immobilizer. The vehicle key will not work if it is not fitted with a microchip, or if the microchip has not been encoded. The same goes for keys that have been cut to fit the vehicle. New keys or replacement keys are available from Volkswagen dealerships or from qualified workshops and authorised key services that are qualified to manufacture these vehicle keys. New and replacement vehicle keys must be synchronised before use. Go to a qualified workshop. Every vehicle key contains electronic components. Protect the key from damage, moisture and excessive vibration. Press the buttons on the key only if the corresponding function is actually needed. Pressing a button when the function is not required could lead to the vehicle being unlocked unintentionally or the alarm going off. This also applies even when you are not within the effective range. 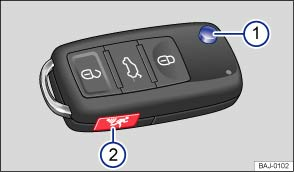 The function of the vehicle key can be affected temporarily if there is more than one transmitter in the direct vicinity working on the same frequency (e.g. a two-way radio or mobile telephone). Obstacles between the key and the vehicle, bad weather conditions and weak batteries can reduce the range of the remote control. 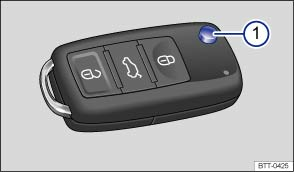 If the buttons on the vehicle keys or or one of the central locking buttons are pressed repeatedly within a short period of time, the central locking system will switch off briefly to prevent overloading. The vehicle will then be unlocked. Lock the vehicle if necessary.